HomeBuyer and HomeOwner Agreements are structured as Option Contracts. This is the legal framework that allows us to give you long-term cash without monthly payments or interest. An option contract gives the buyer of the option the right to buy a specific asset at a later date at an agreed upon price. In short, Unison makes its initial payment to you in exchange for the option to buy a portion of your property in the future at a price that we agree on up front. But we have no desire to co-own your home. We can exercise our option only when our Agreement ends, and solely for the purpose of terminating the relationship and settling the obligation you have to Unison. Most of our edicational materials use a simplified method to calculate Unison's payment when the Agreement ends. The option math works a little differently, but note that both calculation methods will always produce the same results. The example below illustrates this by comparing the simplified math to the option math. 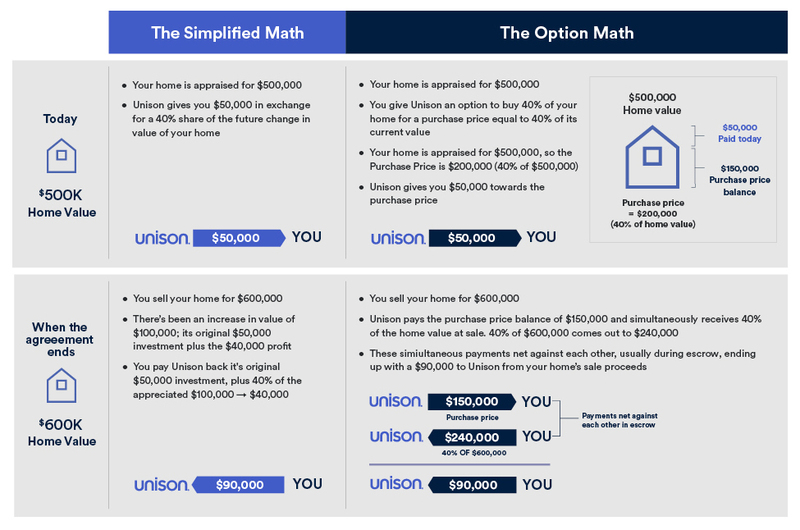 At the beginning, Unison purchases an option to buy 40% of your home, which is worth $500,000 in two payments – one now, at $50,000, and one at future exercise, at $150,000. In the future, you sell your home for $600,000. A title company will typically handle the finances for you, and will process a bunch of transactions simultaneously. In one of those transactions, Unison will exercise its option to purchase 40% of your home by paying the title company the second installment payment of $150,000. In another transaction, they will pay us our “share” in the sale of the home (40% of $600,000, equaling $240,000). But, since the transactions are simultaneous, they simply deduct one from the other: $240,000 – $150,000 = where we arrive at one payment to Unison of $90,000. * Note: The net return to Unison at the end of our agreement together is the same as the simplified, non-option math that shows accessing 10% of a home that appreciates from $500,000 to $600,000 will result in a net payment to Unison of $90,000 at sale. So, the option math is more complicated, but the title company will manage that part. If you focus on the simple math from before, it will do the same job of keeping you on the right page. Remember: You decide when the option contract ends. Unison cannot exercise our option until you make the decision to buy us out early, sell your home, reach the 30 year max term, or if you materially default on your mortgage. Read more about the different ways that our agreement ends later in the section Ending Your Unison HomeOwner Agreement. The Option Contract means we have incentives to work with you through difficult circumstances (foreclosure, damage to the house, etc). Because we want your home to be worth as much as possible (just like you do), we can wait until circumstances have improved and you’re ready to sell. This makes the relationship set up by the option contract different, but in a good way. Unison can choose to offer the homeowner a remedy of Option Exercise And Orderly Sale in lieu of the foreclosure proceeding, by offering to cure the circumstance of default. The homeowner will have the right to accept or reject this offer. Should the homeowner accept the offer, Unison will make one or more Protective Advances to cure the homeowner’s default, and the homeowner will give Unison the right to market and sell the property in an orderly sale in the customary manner in its local market. Option Exercise And Orderly Sale is designed to prevent the home from becoming a “distressed” property and going to foreclosure, which preserves the market value of the property, and the value of both the homeowner’s and Unison’s equity interest in the property. Following the Option Exercise And Orderly Sale, the homeowner and Unison will share the proceeds according to the provisions of the Unison HomeOwner Agreement. We trust you’ll take care of your home – but in the off chance you don’t? Prior to signing an Agreement with Unison, we typically require a home inspection. While many inspections don’t reveal anything new (maybe a lost sock? ), they sometimes uncover defects or conditions that can affect the property value if not addressed. For example, an inspection might reveal significant rot in the framing under the home’s main living area. Issue like this may worsen over time, thus negatively impacting the property’s future value and desirability. If a significant issue(s) is found during the inspection, Unison may make note of it in a Deferred Maintenance Addendum. Ideally, the homeowner will arrange for the necessary repairs to be made. However, if the homeowner doesn’t, Unison reserves the right to treat the issue as a Deferred Maintenance Adjustment scenario in the future. Note: You will always be notified if this Addendum is part of your original Agreement. Beginning three years after your Agreement with Unison, you can choose to terminate your relationship with Unison. An appraisal will take place, and you'll be responsible for the initial amount given to you by Unison, as well as the Investor Percentage (our share of the appreciation) of the Special Termination Price that's determined by that appraisal. Unison does not share in any downside in the case of a special termination, meaning that you'll pay, at minimum, the amount provided to you by Unison. This contains the basic financial terms of the Unison HomeOwner Agreement and describes in further detail how this particular Option Contract works. This outlines your rights and responsibilities under the Unison HomeOwner Agreement, as well as the various ways the Agreement can come to an end. It also documents the legal protections available to both you and Unison. This document creates a secured lien on the home during the term with Unison and says the lien will be recorded in the jurisdiction where the property is located. It also discusses the fact that the Security Instrument is typically subordinated to any existing mortgage on your property. This document highlights specific features of the Agreement for public notice and is also recorded on the property. HomeBuyer: There is a one-time transaction fee equaling 2.5% of the cash proceeds from Unison at your closing. When closing on your new home, you will pay all transaction costs, including third party fees (such as credit and appraisal reports, and title and escrow fees), any lender origination fees, in addition to the Unison transaction fee. This will increase the amount of cash you need to contribute to the purchase transaction at closing. HomeOwner: There is a one-time transaction fee equaling 3.9% of the cash proceeds received from Unison at your HomeOwner Agreement closing. This fee covers all procesing and third-party costs from appraisal and home inspection to titles, state taxes, and settlement costs. For example, if your home's value is $500,000 and Unison is making a $50,000 investment in exchange for a 40% Investor Percentage, the transaction fee would be $1,950 and you would net $48,050 at closing.